Women who experience hot flashes for years or even decades after their final menstrual period have one burning (!) question: when will they end? 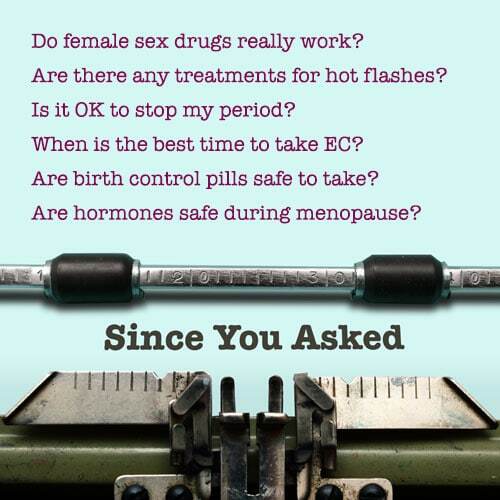 Well, depends on who you ask: in the past, doctors often said hot flashes (officially, menopausal vasomotor symptoms), would last maybe six months to two years. Lately, updated clinical guidelines put the average amount of time during which a woman experiences hot flashes between 5 and 13 years.1 But, new research shows that, for a sizeable minority of women, their hot flashes can endure well into their 60s and 70s, decades after the menopause transition.2 Hmmmmm. I’ve had them for 25 years and counting! The on-going Study of Women’s Health Across the Nation (SWAN) is the most comprehensive investigation of the long-term effects of the menopause transition that’s been conducted to-date. It has studied a range of women’s health conditions, including the menopausal transition’s impact on sleep, cardiovascular health, and hot flashes. As part of this exploration, data from SWAN has been used to look at who has hot flashes and why they last so long for some women.2,3 The study results also dispel some myths about hot flashes’ causes and evaluate possible risk factors that enduring flashing may signal. But many questions still remain. SWAN studied women for 17 years, providing the most accurate and detailed understanding of the menopausal transition to date. The analysis included 3,302 multiracial/multiethnic women who still had their uterus and at least one ovary, and who were not using menopause hormone therapy. This longitudinal, observational study included non-Hispanic White, Hispanic, African-American, Chinese-American, and Japanese-American women, whose health was examined in research centers across the nation. Findings from SWAN and other studies have challenged several oft-repeated theories about hot flashes. For one, the idea that obesity protects against hot flashes because it is associated with higher estrogen levels. Instead, SWAN’s results showed that women who have more fat tissue (adipose tissue), especially underneath the abdominal wall, have the earliest, most severe, and longest-lasting hot flashes. The belief that women of Chinese and Japanese descent had less-troublesome hot flashes because of their long-term consumption of soy products was also not born out in the SWAN study. These findings signal the need for more research. Other widespread beliefs about hot flashes that were dispelled by SWAN include the impact of certain foods, activities, and supplements. Consumption of dietary fat, caffeine, and alcohol were not found to promote hot flashes. Nor did robust physical activity help decrease them. Likewise, the use of vitamins and plant extracts (especially soy products like genistein) was not found to have a positive impact on hot flashes in this study group. SWAN results also contributed to a better understanding of risk factors for hot flashes. Smoking was confirmed to be strongly associated with persistent hot flashes, due to tobacco’s well-researched anti-estrogenic effects. Current smokers in the SWAN analysis had a 60 percent increased likelihood of experiencing hot flashes, compared with non-smokers. Ever having smoked and long-term exposure to second-hand smoke also increased the likelihood of experiencing hot flashes. Poor mental health, including anxiety, depressive symptoms, and perceived stress, was another risk factor that SWAN affirmed, with anxiety being by far the most prominent factor. The SWAN researchers found that women with both anxiety and depression tended to experience their flashes as more bothersome. Poor physical and mental health combined with a history of child abuse or neglect was also commonly associated with hot flashes. Analysis of lab results found that higher levels of the hormone that prompts an egg to pop out of an ovary (follicle stimulating hormone), as well as certain estrogens, may be underlying factors with respect to hot flashes. Results also suggest that having a narrower “thermoneutral zone” may also contribute to recurrent flashing. (The thermoneutral zone refers to the maintenance of body temperature at which a person does not sweat or shiver. ) The phenomenon is not well-understood and clearly needs further investigation. Flushing, sweating, ripping off one’s clothes, and night sweats can be annoying, embarrassing, and disruptive, but research from SWAN now also suggests that persistent hot flashes are associated with potential health risks. While SWAN primarily focused on the endurance and causes of hot flashes, it also examined the role of potential risk factors for heart disease and bone loss that may underlie long-term flashes. For example, SWAN ran a special Heart Study, which included nearly 600 women. This Study found that women who had extended duration of hot flashes were at greater risk for plaque buildup inside their arteries (atherosclerosis). This research on the association between hot flashes and cardiovascular disease is still preliminary, but researchers believe that it may be due to plaque buildup in the veins that occur during and after menopause, which may lead to heart disease later in life. SWAN also affirmed that women who experienced long-term flashes also had lower bone mineral density, especially in the lumbar spine, hip, and the top of the femur (the thigh bone near the ball that inserts into the pelvis). This increases women’s risk of bone fractures and breaks. The SWAN researchers cite this decrease in bone density as a crucial issue that needs further investigation. SWAN is currently analyzing the results of its special Sleep Study, which may help shed light on intense night sweats. Of all of hot flashes’ effects, intense night sweats (and the resulting difficulties falling to sleep, staying asleep, and early-morning waking), is the one women complain about most bitterly. Until the stunning results of the Women’s Health Initiative (WHI), which the NWHN was involved in initiating, many doctors told women not to worry about hot flashes, and handed out prescriptions for menopause hormone therapy like jelly beans. The WHI clearly proved that estrogen replacement increased the risk of breast cancer. In the wake of the WHI, many women stopped taking estrogen replacement and reported that their flashes returned. For some, the flashes did so with a vengeance. Because continuing flashes are bothersome for many women, and extended use of estrogen treatment is contraindicated, more research needs to be done on alternative options to help women make judicious choices about which ones to pursue. While research continues, what can women do to manage bothersome flashing? There’s a lot of self-help information out there, but it seems to be trial and error, with mixed results, for many women. Like the Post Office’s Forever Stamp, perhaps there should be a Forever Hot Flash stamp for some women. I asked Dr. Thurston, hopefully, whether there was any up-side to long-term flashing. “Well,” she paused, “they tend to get milder over time.” And indeed, I have found this to be true, but I’m still removing my long-sleeve polo shirt every 45 minutes. Rebecca Chalker, Ph.D., is an Adjunct Lecturer in Women’s & Gender Studies at Pace University, and the author of The Clitorial Truth. 1. ACOG Practice Bulletin No. 141: Management of Menopausal Symptoms. Obstet Gynecol. 2014; 123(1):202-16. 2. Thurston RC and Joffe H, “Vasomotor Symptoms and Menopause: Findings from the Study of Women’s Health Across the Nation,” Obstet Gynecol Clin North Am. 2011; 38(3):489-501. 3. Avis N, Crawford SL, Greendale G, et al. “Duration of Menopausal Vasomotor Symptoms Over the Menopause Transition,” JAMA Intern Med. 2015; 175(4):531-539.